We also perform small projects as diamond work continuation. Sawing opening with installation of fire doors with "keys to the hand" -style. Small demolitions (We do not compete with big demolition companies.). Small demolition and waste export alongside diamond work task. 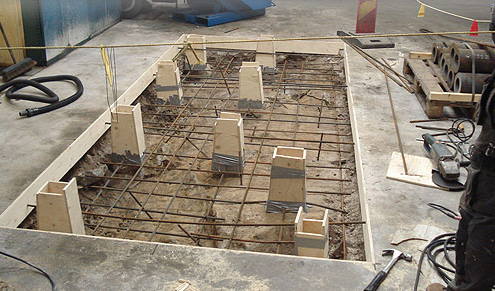 Machine base demolitions and castings. On the top right side a picture of a machine base project. We sawed an opening, we dug the dirt out, we did the reinforcements and castings. Different types of grommet installations after drilling. The base floor ventilation hole drilling and base vent installations. Diamond works performed also in extremely clean circumistances fe. hospitals, inhabited housings, luxury properties etc. 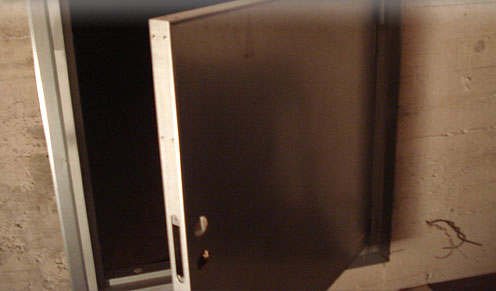 Shielding must have enough time reserved and we have the experience. We have also implemented attict extension openings, when downstairs is already inhabited and the opening had to be done nearly without a trace. Nowadays common jobs are also inhabited apartments, creating door-, window- or service openings or their enlargements. In apartment buildings should also be taken in consideration, that building permits must be retrieved by the subscriber. Often, if the opening is performed on a supporting wall, there must be installed a support bar. Work plan must be then precise. We have done these kind of openings in homes equiped with parquets, when again shielding requires reserved time and work must be done with patience, so that accidents do not happen. Ask for special jobs... so we will see, how we can assist. Work Manager with years of experience and different types of construction projects is at your disposal.